Synopsis: In the heart of the majestic New Zealand landscape, a national manhunt is launched after a mischievous teenager and his grumpy foster uncle, run away into the forest. Review: The incredible and quite breath taking New Zealand countryside has certainly featured on the big screen before, most notably in Peter Jackson’s tremendous Lord of the Rings trilogy, as well as his not-quite-as-tremendous-but-still-great Hobbit trilogy. It’s quite fitting then, that New Zealand born director Taika Waititi, in his latest film, a character makes a quite brilliant reference to the former trilogy, as the main characters find themselves in a very similar situation to one in the Lord of the Rings, but this is by no means a similar movie to the aforementioned trilogy. There are no rings or orcs to be found here, instead we have Ricky Baker (Dennison) a troublesome teenager who has been given a chance for a new life with new foster parents. All appears to be going well, yet due to various circumstances, Ricky and his “uncle” Hec (Sam Neill) begin an adventure in the New Zealand shrubbery. All the while, the duo become the centre of a massive manhunt in order launched by the authorities in order to bring these two home, and a hilarious and very heartfelt adventure begins. 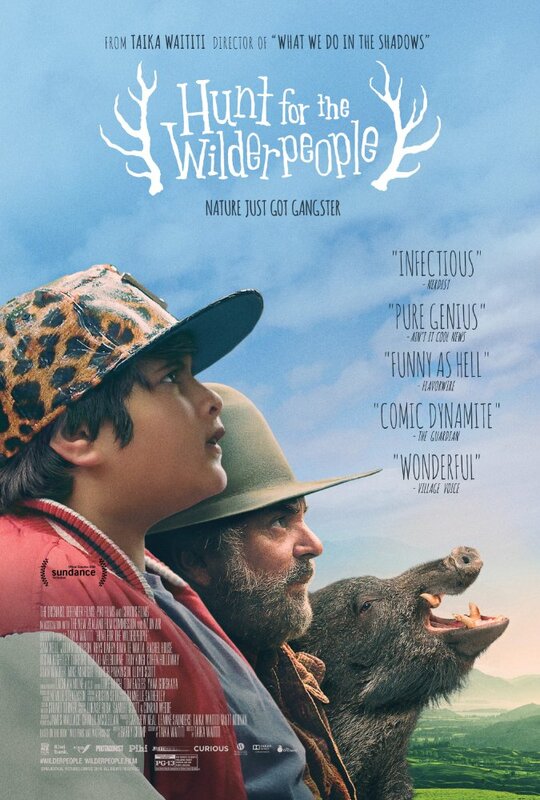 Adapting the screenplay from the novel Wild Pork and Watercress by Barry Crump, Waititi blends the humour of the story (of which there is plenty) and this is combined with some brilliant acting from the two main leads. It is clear that upon their first meeting Uncle Hec is not exactly keen on Ricky, but through time, they begin to develop a connection and an understanding of one another and the path that lead them to meet. Neill is tremendous but more often than not it is Dennison who steals the show with his obsession with everything “gangster” related, even going so far as to name a dog after a very famous rapper! The chemistry between the actors is tremendous, and the dialogue between them is equally so, and Waititi himself makes a cameo that is a contender for cameo of the year. As well as the quite brilliant LOTR reference, there are plenty of other superb either visual nods to classic movies, or some rather amusing references to other Hollywood classics packed throughout this quirky picture. The cinematography is also spectacular, with Waititi taking full advantage of the New Zealand landscape in a similar vein to Jackson with both of his Middle Earth trilogies, with plenty of awe-inspiring wide shots that will make the viewer feel like they are in the deep dark wood with the characters. With a great soundtrack to boot, Waititi has crafted a quite brilliant piece of film-making that combines memorable characters with a very genuine, heartfelt story that is hilarious to boot. Given that his next project is a massive Marvel Cinematic Universe movie, namely Thor: Ragnarok, a universe that is known for its excellent use of humour, the director is certainly going from strength to strength. MCU fans can rest assured that this Marvel picture is in very safe and capable hands, hands that might be able to lift Mjolnir! With a very witty and sharp script from Waititi, excellent performances from the lead duo, fasten your seat belts for a very entertaining romp through the New Zealand wilderness! Thanks for the review! Was curious about this movie and am now excited to see it. You’re welcome!! Thanks for reading my review! Hope you enjoy the film!